GB3GH is a 70cm analog voice repeater operated (since 28/12/2001) from Churchdown Hill (located mid-way between Gloucester and Cheltenham) [IO81VU] at approx 150m above Sea Level. A coverage map is available from the RSGB Emerging Technology Co-ordination Committee. 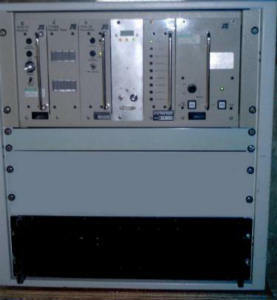 The repeater on Channel RB5 (433.125MHz Tx, 434.725MHz Rx – CTCSS Tone 118.8Hz ‘J’ ) has been operational since 1984. Current equipment (since 26th February 2006) comprises a Tait 800 Series Transceiver, with PIC based control logic designed & constructed by Steve (G4FPV) and cavities constructed by the group, the antenna system is a small co-linear to give an ERP of 25 Watts (as permitted by the licence).